no need for a rental car anymore - the golf shuttle is here! 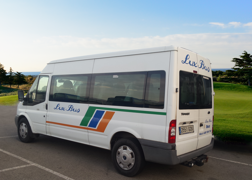 We are very pleased to announce that we from March 2016 can offer a Golf Shuttle-service between our hotels, golf courses and our two airports (Barcelona and Reus). The Golf Shuttle is available for any group size but the minimum charge is for 4 persons. This means that bookings for 1-3 persons will be accepted but the price per person will be higher since the minimum charge is for 4 persons. Transfers will always be booked to fit as good as possible with your golf schedule and your flight schedules. Maximum waiting time at the airport when arriving is 1 hour. Period of operation: March 1st - June 15th and September 1st - November 30th. This service has to be booked at least 14 days before arrival. Bookings made with shorter notice are possible but will be “on request” and cannot be guaranteed. * Golf courses included: Lumine Lakes, Lumine Hills, Lumine Ruins, Bonmont, Costa Dorada and Aigüesverds. For La Graiera or Panoramica there is a supplement of 20 euro per person. On the "Golf Shuttle" golfers are allowed to take (per person): one small piece of handluggage, one suitcase and one golfbag.